A Roadway driver is driving east on Route 66 he sees a truck driving west and the CB crackles to life . "Hey Roadway driver whos the two biggest poofs in America?" comes from the CB. The Roadway driver replies . The other trucker says " You and your brother ". Well the Roadway driver gets all annoyed but the other driver tells him "Its just a joke - tell it to the next truck you see." Well the Roadway driver drives for about an hour an finally sees another truck .he gets on the CB and says " Hey other truck do you know who the two biggest poofs in the world are?" The other trucker says " I don't know who?" 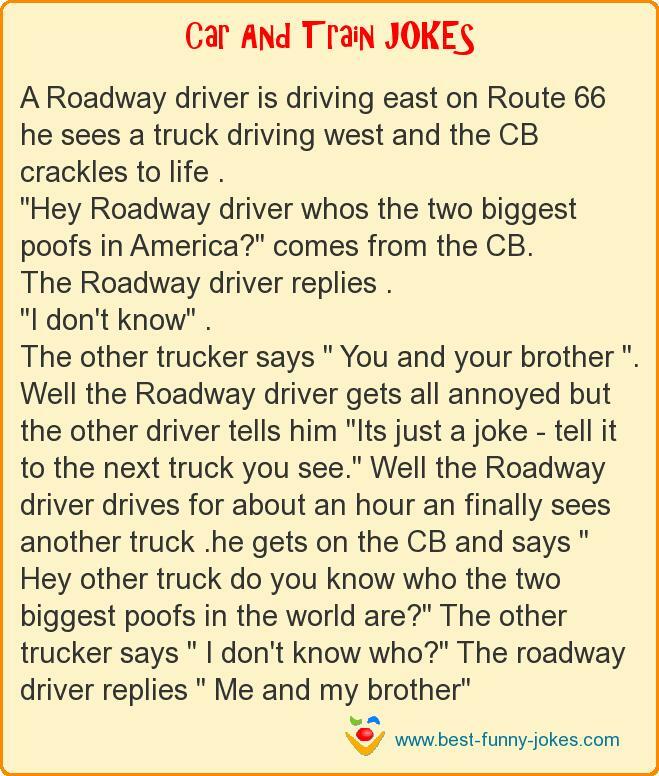 The roadway driver replies " Me and my brother"